The Global Climate Action Summit that took place in San Francisco on September 12-14 aimed to inspire commitments from local governments to tackle climate change and achieve the goals of the Paris Agreement. 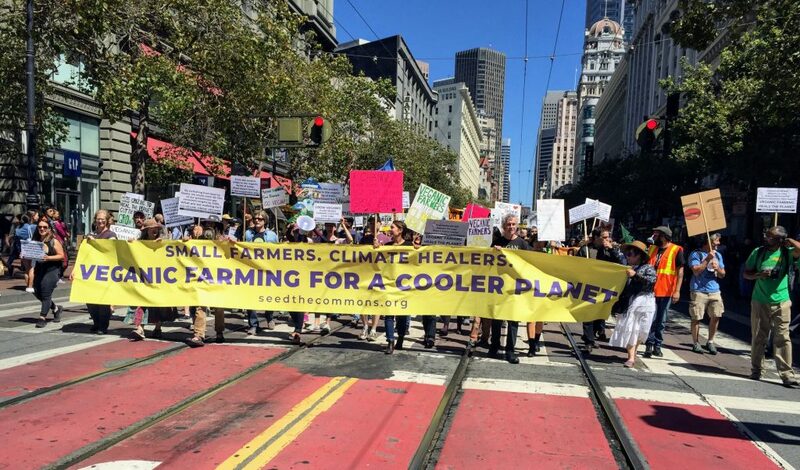 On the Saturday before the summit, thirty thousand people converged at the largest climate mobilization on the West Coast to demand real solutions led by frontline communities. 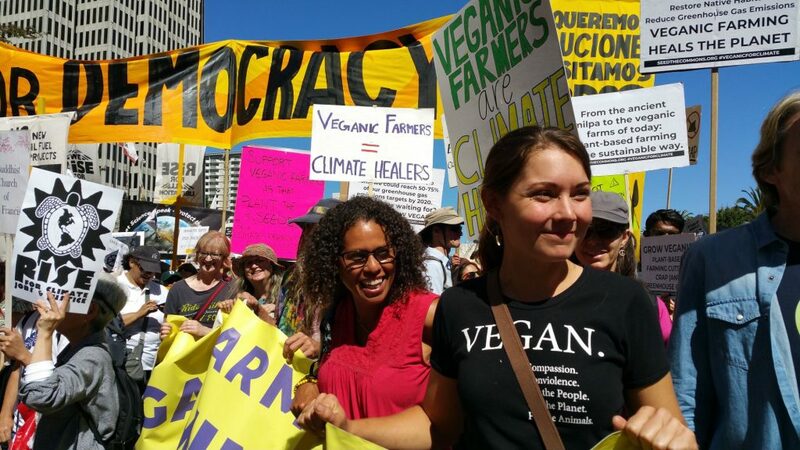 Small-scale, veganic farmers arrived from around North America to lead a veganic contingent – the first and only contingent of its kind at any climate march. The word “veganic” is a portmanteau of “vegan” and “organic” and refers to a range of farming practices that are both organic and exclude the use of exploited animals or their byproducts. Our contingent aimed to bring attention to the role of agriculture in driving climate change and to call for a transition to vegan agroecology as a key strategy in fighting it. Seed the Commons organized the veganic contingent in response to several problems with the current state of climate discussions, the first being that agriculture is usually left out of the conversation altogether. A 2017 study shows that if Americans switched from beef to beans, this one dietary change ­would allow us to achieve 46% to 74% of our targeted GHG emission reduction for 2020. As stressed in the Atlantic: “Even if nothing about our energy infrastructure or transportation system changed—and even if people kept eating chicken and pork and eggs and cheese—this one dietary change could achieve somewhere between 46 and 74 percent of the reductions needed to meet the target.” Given the well-documented and drastic contribution of animal agriculture to GHG emissions, it is unbelievable – criminal even – that so few advocate for dietary change. When agriculture is spoken about, we are often confronted with the promotion of false solutions from all sides: more tech-fixes and pro-business policies from Big Ag and their lobbyists, more grazing from the environmental movement. The first problem is just one example of the wrong-headed approach of climate capitalism, whereby the problems wrought by capitalism are to be addressed with more of the same. With the second, ranchers are opportunistically conflating grazing (regenerative, holistic, etc) with the deindustrialization of farming at a time when more attention is brought to the harms of industrial agriculture. 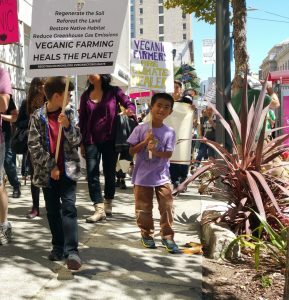 The word veganic reverberated through San Francisco’s Market Street as farmers marched loud and proud. Industrial agriculture contributes to climate change in a number of ways, including the depletion of soils. The idea of regenerative agriculture is to combat climate change by building soil to sequester carbon. While agriculture can and should play this role, grazing cattle is in no way a necessary component of regenerative systems. The belief that ranching is what is going to save us has nevertheless become a widely accepted truth, probably as a result of sheer repetition. More generally, movements that call for any form of ecological farming usually promote animal husbandry as a default or necessary part of their systems. While the science is not actually there, the widespread endorsement of regenerative grazing creates the illusion of an established truth and has served to muddle the connection between animal agriculture and climate change. Furthermore, the rhetoric of regenerative grazing has turned the relationship between farm animals and biodiversity on its head. One pro-grazing argument is that large herbivores fulfill key ecological functions for which cows are a necessary replacement to the native wildlife that has presumably disappeared. In reality, native and wild herbivores still occupy grazed lands and are continuously killed and dying off due to the competition. Bonnie Hildebrand, Oregon veganic farmer. 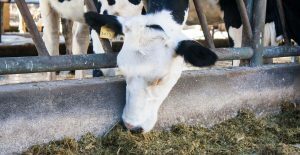 During the week of the summit, an initiative called Zero Footprint Dining Week enlisted Bay Area restaurants to go carbon neutral and the proceeds were donated to two projects: a dairy farm in Michigan and “climate beneficial ranching” in Marin county. 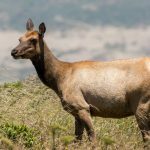 Marin County is where three environmental organizations recently sued Point Reyes National Park for renewing ranching leases without environmental impact studies, claiming that ranching had polluted waterways, trampled native habitat and that the native Tule Elk were dying due competition over forage and water. 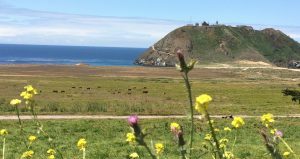 (1) Remember: the ranching in Point Reyes is of the local, organic, “sustainable” sort touted by many in the environmental movement. The conflict between ranchers and native wildlife has existed since the beginning of colonization and with ranching being a primary driver and mechanism of colonization, the Zero Footprint Dining Week initiative was in particularly bad taste. While the environmental movement increasingly peddles the myth that ecological farming requires domesticated animals, the small farmers who made history in San Francisco last month are living proof that it does not. So what exactly is veganic and why are we keen to go beyond regular organic? Veganic is a broad term that refers to any farming that excludes farm animals and their byproducts. 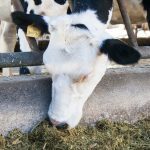 For the most part, organic farming relies on animal byproducts for fertility: manure, bloodmeal, bonemeal, fish emulsion and more. The vast majority of organic farms in the US source these products from factory farms and slaughterhouses, so organic production is often linked not only to animal agriculture, but to industrial animal agriculture. On a comparable farm, veganic farmers will use plant-based fertilizers instead. The new faces of agriculture. 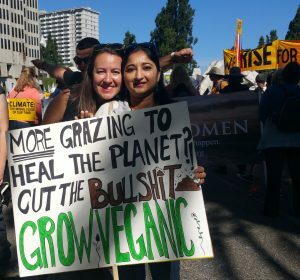 Liz Ross, co-director of Vegan Advocacy Initiative and apprentice at the UCSC Center for Agroecology & Sustainable Food Systems and Alisha Utter, Vermont veganic farmer and Agroecology & Soil Science PhD student. However, Seed the Commons advocates for a vegan agroecology, where the focus is on building the fertility of the soil and creating a healthy system that is as closed-loop as possible. On a comparable non-vegan farm, farm animals will be part of this closed-loop. We are wrongly led to believe that farm animals are indispensable in such systems but this is false, and animal-based systems are more land-intensive and emit more greenhouse gases than plant-based systems. The question of land use brings up an often overlooked point: the need to rewild more land. And while the talk of regenerative grazing has put grasslands on our minds, we are also forgetting the need to protect forests as carbon sinks. Transitioning away from industrial and animal agriculture would allow us to reduce GHG emissions, regenerate soils to sequester carbon, halt the frenetic deforestation caused by ranching, and restore native habitats and biodiversity. We don’t need creativity or ingenuity: small farmers are already implementing solutions to heal the climate. What we need is to give them a platform and implement policies and institutional changes that support them. 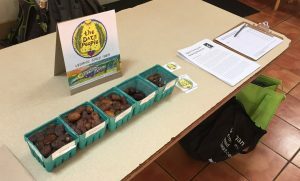 Sampling California-grown veganic dates at the Soil Not Oil Conference. Our solution to climate change is sweet as can be! 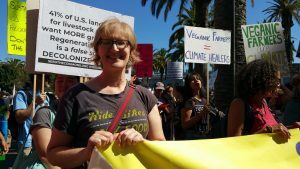 The veganic contingent was led by farmers from Southern California, Oregon, Vermont and Canada. We were also supposed to be joined by five farmers from Northern California, but they all had to cancel at the last minute. One couple canceled for health reasons, two farmers canceled because the day before the march they were threatened with losing half of their land and needed to urgently deal with the crisis, and one farmer canceled because he was afraid of leaving his farm unattended in the midst of wildfires. 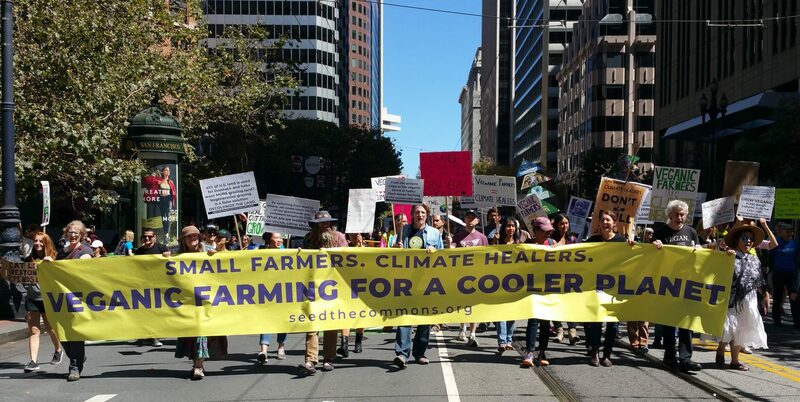 Bay Area activists rallied behind small farmers from around North America to proclaim that while agriculture is the problem, it is also the solution. Addressing the climate crisis requires nothing less than the transformation of our food system. 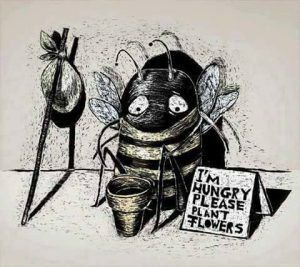 The corporatization and industrialization of food systems is heating the planet directly as well as indirectly. Indeed, the corporate takeover of food systems is central to capitalism and is the basis on which are built other polluting industries. It is urgent that we defend and reclaim land and seeds and reject the paradigms of corporate agriculture, but promoting “sustainable” animal agriculture as the alternative is misguided. We ask that policy-makers support a transition to small-scale veganic farming, that the environmental movement center agriculture and the voices of veganic farmers, and that eaters go vegan and support veganic farmers when possible. Veganic farming is a real solution and the way of a climate-friendly future. 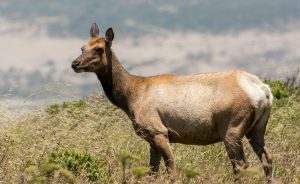 (1) Learn the facts v. the myths of ranching at Point Reyes National Seashore and support the effort to restore the park. (2) On September 10, we hosted an event an event titled Rise For Climate: Food, Agriculture and the Environment that featured a veganic farmer roundtable, and on September 11 we presented a panel at the Soil Not Oil Conference titled Veganic Farming: Growing the Movement for Climate-Friendly Agriculture.